One of the founding premises of Space Play is to explore how our ability to understand and represent architecture could be translated into artwork and products that would celebrate the emotional connections that people have with buildings. Locals to Birmingham, and with the imminent demolition of John Madin’s Central Library, it seemed poignant to explore the stories of some of Birmingham’s 60’s and 70’s concrete architecture. Everybody knows the Rep, but no one really looks at it. This was certainly the case for me, until my first visit to the building to begin our brutalist case study. I thought I knew this building well and it had become a backdrop structure for my own experiences of Birmingham’s urban land- scape. But on this sunny day, and especially from certain angles, the building danced. Through renewed eyes I fell completely in love with it. It’s complex but composed forms and textures are a delight to explore, and its heavy concrete formwork somehow oats; weightless, giving a sense of ease to its stance. The textured concrete façade was designed to resemble the rough bark texture of a tree, but the texture also creates a clever self-cleaning detail by allowing rain to run down the external walls. The curves of the windows conceal beautifully detailed drainage channels to preserve the window seals, and it’s these little elements that really make the building special. The building expresses its internal functions openly, the 22 meter high y-tower rising above the main stage being the most obvious example of this. Everything about it articulates the grandeur of theatre. Internally the glazed façade pours light into the two-storey gallery with the distinctive forms of the bowed concrete arcade casting evocative shadows into the space. The complex but legible and welcoming gallery space is almost cave-like with its walls and stair structures holding on to the textures of the timber shuttering used for the concrete formwork. There is poetry to this architecture as well as function. 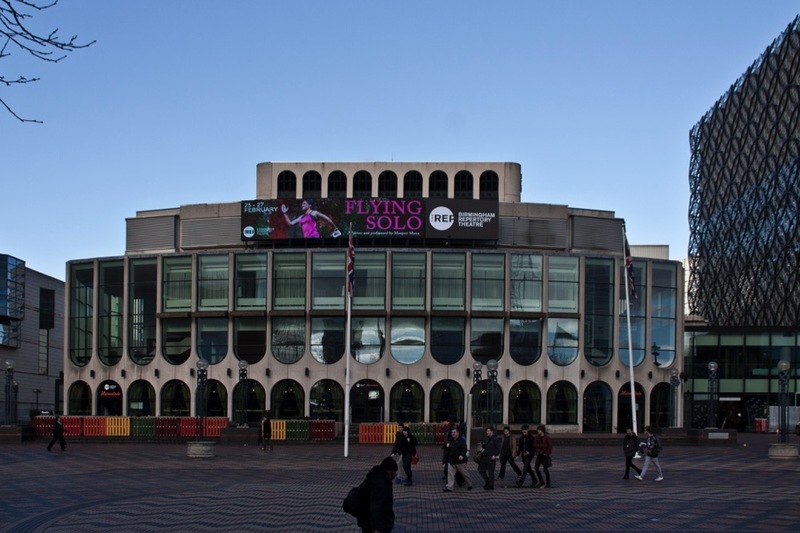 The fly-tower (centre) rises to 22-metres, housing stage equipment, pulleys and mechanics. The theatre was designed for a completely different physical context and within a different cultural context than it stands in today. But its form and style sits calm and cool amongst a changing and imposing landscape full of post-modern gimmicks. The concrete arcade of the façade facing onto Centenary Square was designed so that it would reflect in a water pool which was pro- posed but never built. The building had also been sited centrally in the original city square, which planned to be three times the size of the current space. 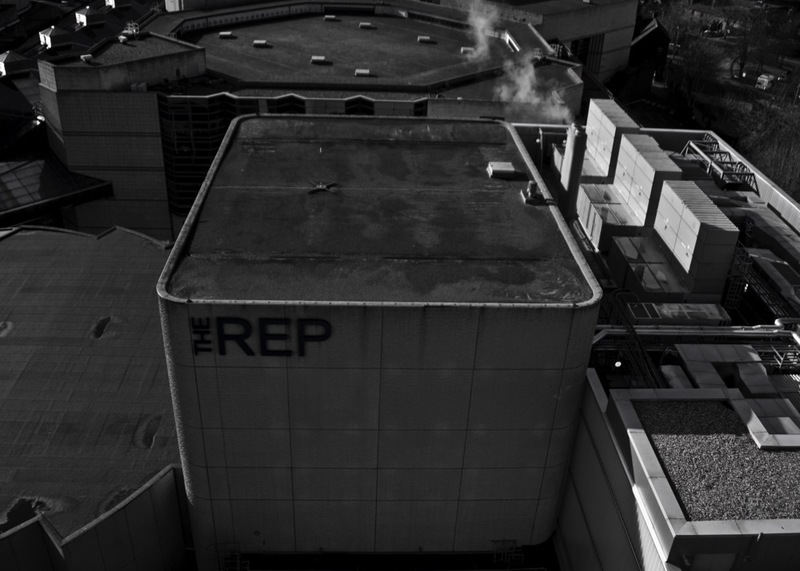 Yet as the grand schemes of Birmingham faltered and changed, the Rep held out. Great architecture doesn’t come about just because of good architects though. It is created by the vision of a great client, which a good architect is able to capture and create. This is a major reason for the success of the Rep. 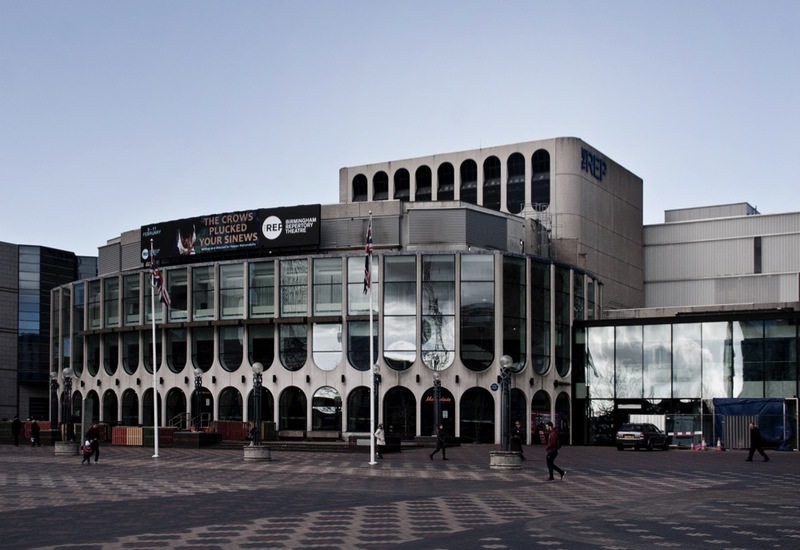 The story really starts with Sir Barry Jackson, one of Birmingham’s great visionaries who set up the Birmingham Repertory Theatre in 1912 (now called the Old Rep). 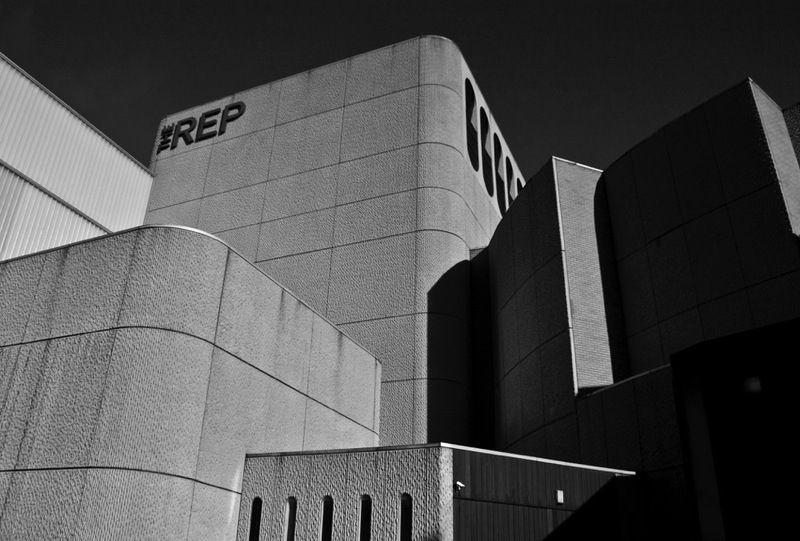 His bold and innovative ideas about how the art of theatre should develop and his passion for progression led to the creation of the Birmingham Rep as it is known today. His hands-on approach to managing the Rep helped to form the initial ideas throughout the 1950’s and to bring the City Council funding on board that led to the creation of this current building; a legacy wholly appropriate.